1. I’ve lived in some pretty cool places. When I was about 2, my mum moved us both to South Africa for a couple of years. Good decision! Most of the pictures of me in S.A involve bright blonde hair and a sweet tan.. Oh to turn back to clock. In 2009 I also moved to New Zealand for a year, after being stuck in a bit of a rut. I got my working holiday visa, got myself a great job and met some of the best people. 2. I’m a cooking geek. I’m obsessed with collecting recipe books and love cooking from scratch. A few years ago I went through a phase of making loads of fudge.. Then cheesecakes. I love being creative in the kitchen and thinking of yummy new things to try. 3. I’m scared of deep water. Weird, I know. I can swim pretty well, and swimming pools don’t bother me. But the sea. Oh no. I can swim around in open water just fine, until my brain wakes up and reminds me that I’m floating around in very deep water, far from the bottom and there could be anything underneath me. Eurgh. Cue panic and a quick swim back to shore. 4. I started a photography degree.. But didn’t finish it. After I left college with A Levels in Photography, Psychology and Philosophy (I don’t know, I was 18, K). I thought it would be a good idea. I’ve always loved photography and know my way around a film SLR pretty well (all those days in college winding film negative on to spigots). Then part way through I learned that the UK churns out more photography degrees then there are “photography jobs” in the whole of Europe (note, obviously you could just go self employed) and I realised it wasn’t what I thought it would be. I dropped out and carried on working and have done ever since. I didn’t go back to uni. 5. I’m a trainee lawyer. Despite my lack of degree, I currently work as a medical negligence Paralegal (which I LOVE), and I’m studying to be a Lawyer. I’m doing it through a distance learning course, which means that I can still work full time and will eventually qualify as a Chartered Legal Executive. Did you know that you don’t need a degree to be a Solicitor or Lawyer? 6. 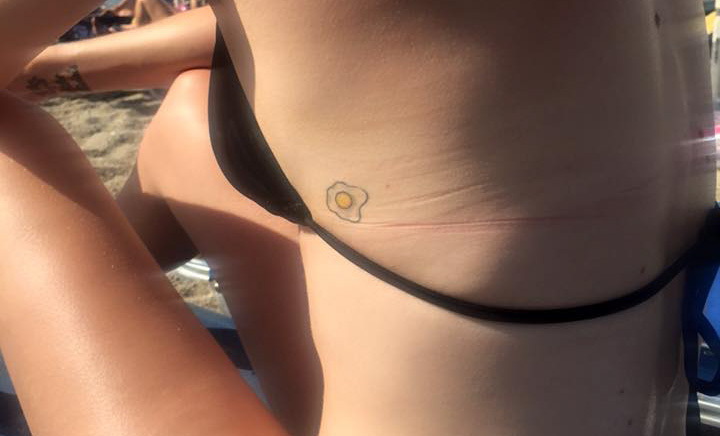 I have a tattoo of an egg. Yep. A fried egg (Haribo style). Its very teeny and on my ribs. I got it on a silly whim because AJ and I call each other egg (and other related nicknames) and I don’t take tattoos too seriously. The irony is that I absolutely hate eggs and don’t eat them (unless its cake, then I eat ALL the cake). 7. I love to travel and go on adventures, but I’m also a homebody. I have this weird to and fro in my head; one side of which wants me to go exploring new places and do cool things and run around in the fresh air a bit. And this other side that comes home every day after work, plops on my pyjamas and hibernates, eating snacks. I love closing all the curtains, lighting some smelly candles and wrapping myself up in a blanket on the sofa (with AJ and Archie, of course). 8. I eat a LOT. Its something I often feel like I need to point out to people, because I’m naturally very slim and always have been. When people see me eat, they quickly realise that its just that metabolism is my friend and I am bottomless pit. Especially when it comes to cheese. Or crisps. Or parma ham. Luckily I absolutely love vegetables and salads too, so I guess I’m lucky on that front! 9. I’m incredibly anxious a lot of the time. I left home when I was 18 and very quickly realised that there were a lot of things I didn’t like doing myself. I just thought I was shy; I hated going food shopping alone, used to sweat over the idea I might have to walk into a pub or bar on my own and try and find my friends (what if I cant find them, what if everyone looks at me). As I got older I realised that it’s just anxiety. “Just anxiety”. It still affects me a lot now, but I’m far better at coping with it – mostly because I can say “I’m being anxious” and I know what causes it. I’m naturally dark blonde and for years I had highlights to make me super blonde. My hair is pretty thin which means the colour lifts quickly and I’ve always been lucky enough to have good hairdressers who can keep me blonde, without frying my hair. At the start of this year, sick of paying out lots of money on my hair, I went brown all over to give me a chance to grow it out. I have a little bit of ombre on the ends to keep it from feeling too dark. I definitely miss being blonde – I sometimes feel a bit unlike myself with dark hair! Which is why there are not many current pictures of me floating about…! So that’s it! Ten very random things about me. Has anyone else done a similar post? Send me your link so I can be nosy! Next Post A Personal Post – Reflecting on the past few weeks. I work for a law firm and it's brill that there are different routes with CILEx. I dropped out of uni too and I think people often think it's the be-all-and-end-all.